We do not allow packaging of meat or fish in our cabins. We do not allow dogs in our cabins. Our Discovery Cabins have everything from incredible waterfront views, to trails that feel as if you're going back into cultural history of the native people who were first to call Kasaan home. When you book a stay in Kasaan you get the opportunity to enjoy our modern style cabins and experience the lively energy of a small rural Alaskan village. 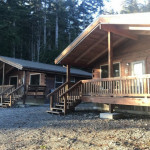 We offer services such as Tours of the Totems Historic District and Traditional Long House "Naay Iwaans" , Food services located in our Tribal Hall (Cafe Schedule Permitting), carving lessons in our carving shed with a local Alaska Native artist, and community events throughout the year (Find Comprehensive list on our website www.kasaan.org).